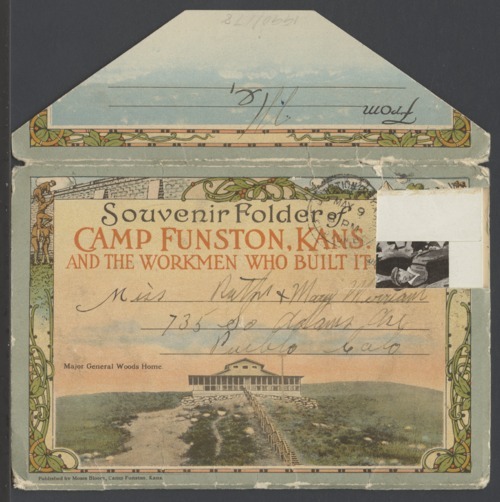 This souvenir folder on Camp Funston includes a color photo of home of Major General Woods; a panoramic view of the camp on the Ft. Riley military reservation near Junction City, Kansas; a view of some of the troops, the first territorial capitol of Kansas; troops on a pontoon bridge; mounted troops; a panoramic photograph of the the civilian workers who built the camp; and the Union Pacific railroad station at Camp Funston. There is also a listing of the accomplishments of the first six months of the war. The facility, named after Brigadier General Frederick Funston, was one of sixteen divisional cantonment training camps built during World War I to house and train soldiers for military duty. Construction began in July of 1917 as approximately 15,000 carpenters built buildings in city block squares. The number of buildings estimated to have been erected at the camp were from 2,800 to 4,000 to accommodate the over 40,000 soldiers from the U.S. Army's 89 Division that were stationed at the facility. After the war, Camp Funston became a "mustering-out" center as soldiers prepared to return to civilian life. In 1924, the military decommissioned the 2,000 acre site and dismantled the buildings.